Having hung up his trainers, Jamaican sprinter and all-round entertainer Usain Bolt is to open a rum-focused restaurant in London’s Liverpool Street next month. 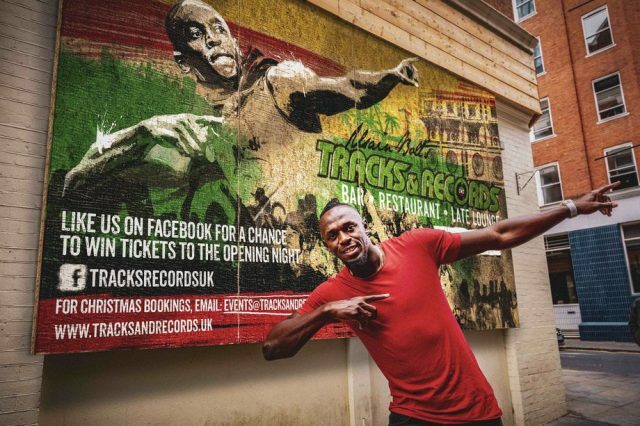 Called Tracks & Records, the Jamaican-themed bar, restaurant and ‘late lounge’ will open on Middlesex Street in East London’s financial district on 10 October. Plans for the restaurant first surfaced in August for the fourth site in the Tracks & Records chain, adding to Bolt’s restaurants in Kingston, Ocho Rios and Montego Bay. Partnering with Kingston Live Entertainment on the venture, Bolt will serve Jamaican classics like jerk chicken and pork; and fried fish and cassava flatbread. Split across two floors, Tracks & Records will be decked out with Bolt’s sports memorabilia and will feature live reggae and dub sets from leading UK DJs. At the bar, hundreds of rums will be on pour including 100 from Jamaica. “London is my second home and a place very close to my heart, so it’s brilliant to be sharing a taste of Jamaica in the capital,” Bolt said. “After much success with our Track & Records restaurants, we’re delighted to be opening in the UK,” Gary Matalon of KLE Group added. Tracks & Records will be open from 11am until midnight Monday to Wednesday; until 1am Thursday to Saturday and from 10am to 9.30pm on Sunday.